-We want to PAUSE the erection of any structure or the change to any existing structure that is scheduled to be built taller than fifty feet high---PERIOD. -We then want our public officials to present to us in the same mass manner they communicate with us when they are running for office, ALL OF THE REZONING and LANDMARKING OPTIONS, not just the ones they like. The online petition has gotten about 175 signatures from neighborhood residents so far and supporters were out at the Smith Street Fair on Sunday collecting signatures as well. Something gives us the feeling the weather isn't the only thing that's going to be hot in Carroll Gardens this summer. 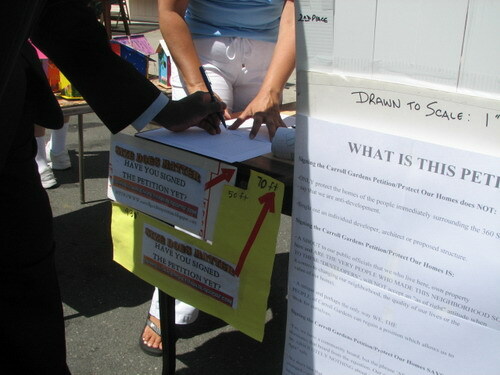 I heard about 300 signatures at the street fair. Bringing the total to 475... not bad for a petition launched 3 days ago. 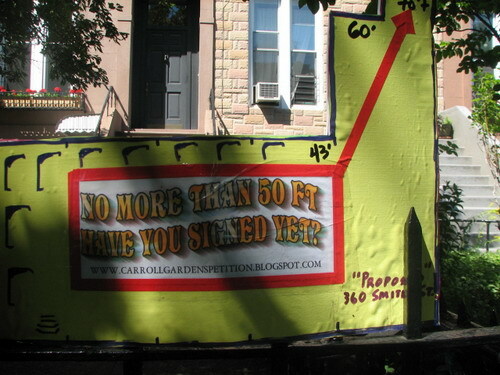 the petition only requests a moratorium (a temporary halt) on the construction of new or existing structures whereby said structure(s) would attain a height above fifty feet.... UNTIL ALL rezoning options (some include setbacks of indeterminate height) and landmarking/historic district classification have been thoroughly presented, decided upon by the majority of our residents and enacted--so, your dream of an additional floor(setback) would be possible depending upon the path chosen.Have you looked into the possibility of this type of alteration now? You may be surprised to find that the existing regulations may prohibit this for your particular situation--this petition may be the first step in realizing your wish--as far as setback visibility from the street--take a look at the house on 3rd place bet court & smith--can you or anyone else honestly say that they don't see that setback? You better build it quick Anonymous. Those who oppose you utilizing the rights you earned when you purchased your property are trying to take that away from you. It is easy to scare people about almost anything. We like our neighborhood after all and there will always be a way to demonize change. Build as high as you can as fast as you can, protect your rights. There are many in this neighborhood who are out to take them from you. This is not about taking away a homeowner's rights. It is about an already densely populated neighborhood,with an undersized school system and a fairly crumbling infrastructure that no one else is bothering to address. A neighborhood that is being dug-up,bulldozed,stirred and carved into an even more densely populated, even shakier infrastructured,more overwhelmed school system than what exists right now. Some people in this neighborhood would like to see development take place at a level that takes these things into consideration,since inevitably, those of us who plan on staying here, will have to live with the aftermath of development out of pace with infrastructure growth/improvement long after most of you anonymae have left to go save the rights of other poor unsuspecting beings. Real Estate Firm Already Improving Park Slope! Watch Cars Illegally Entering Prospect Park!